If you are one of the Apples’ iPhone fans and would like your Windows Mobile device interface runs like the famous gadget, then this could be the right application software for you. I have tried it for few days and it works great and nice to show off to friends around. GoodWin, a new Windows Mobile Device Application software developed by VitoTechnology can give u a totally fresh view on your smartphone. As compared to iContact that we introduced previously, this application seems to have more and nicer GUI (Graphics User Interface) not only limited to Contact List. Similarly, user can slide down the menu list by tapping and dragging using dual finger scrolling method. Besides, it helps user to categorize the menu lists properly for fast selection. Only minor drawback, it won’t respond to your landscape mode especially for those devices that support sliding hard keyboard. Also, some of the icons are not clickable and the scrolling experience could be troublesome if you are already getting used to tapping and typing instead of dual finger scrolling action. The application software costs around $14.96 which is quite reasonable for those that intend to own an iPhone interface while still able to enjoy the 3G (if you own a 3G smartphone) browsing capability. 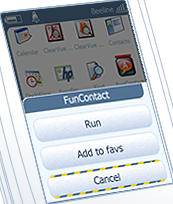 It occupies around 1MB space and is fully compatible with Windows Mobile 5.0 and 6.0 version. For Windows Mobile 2003 version, it may not able to provide full functionality but no harm to get a 14-days trial by downloading here if your device space allowed.